British tourists are too complacent about contracting malaria as they travel to more and more far flung locations, say campaigners. 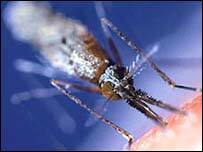 Around 2,000 Britons get malaria each year, and deaths are low but rising. Last year around 5m travelled to risk areas, but 60% did not take the right health advice before they set out. Last minute bargain hunters are at risk because they don't leave time to arrange medication, said campaigners organising Malaria Awareness Week. Travellers' ignorance was blamed by researchers for a doubling of malaria deaths in the UK between 2002 and 2003, with the figure rising from nine to 16 deaths. Last year figures showed the most lethal form of malaria - Plasmodium falciparum - accounted for a rising proportion of the total number of cases imported into the UK. There has been a steady increase in the past decade in travel to Asia, the Caribbean, and south and central America. Several countries in these regions have become more accessible over the last few years, including Vietnam, Cambodia, Myanmar, and Thailand. New research shows the spread of malaria poses a more substantial risk to travellers in South East Asia than previously estimated, with the region contributing 25% of the world's estimated 500m cases of falciparum malaria in 2002, said campaigners. About 40% of the world's population, mostly those living in the world's poorest countries, is at risk of malaria, which is life-threatening but curable if diagnosed early. As part of the awareness week an exhibition called Just One Bite will run from 15-18 May at The Natural History Museum in London. The campaign week - fronted by John Craven OBE - starts on Monday 16 May.